Looking at Milwaukee's cordless M12 line of tools, it is pretty clear that part of the crowd they are targeting are Technicians. When we look at their past hand tools and again what will be launched this May, we are seeing a strong line of hand tools that meet the needs of Technicians as well as other trades. Let's take a looks at what is coming. Milwaukee is not just coming out with one 10-in-1 bit driver, they are actually coming out with several models in a couple of versions. They will offer Multi-Bit drivers in a ratcheting or regular non-ratcheting form, with a couple of bit driver combination choices. They will also be offering 10-in-1 Key drivers with your choice of Torx, HEX SAE, or HEX Metric. All models will include 3-1/2-inch power groove bits that can also be easily chucked into your power tools and are chrome plated for rust protection. Both a wire stripper and a wire loop maker are present on the tool as an added convenience. The handles of the drivers have flat spots to accept a wrench, if additional torque is needed. 10IN1 ECX™ Multi Bit Driver (48-22-2101): 10 functions include ECX™ #1, ECX™ #2, PH #1, PH #2, SL 1/8", SL 1/4", SQ #2, wire stripper, loop maker and ¼" nut driver. 10IN1 Square Drive Multi Bit Driver (48-22-2102): 10 functions include SQ #1, SQ #2, SQ #3, PH #1 PH #2, SL 1/8", SL 1/4", wire stripper, loop maker and ¼" nut driver. 10IN1 ECX™ Ratcheting Multi Bit Driver (48-22-2301): 10 functions include ECX™ #1, ECX™ #2, PH #1, PH #2, SL 1/8", SL 1/4", SQ #2, wire stripper, loop maker and ¼" nut driver. 10IN1 Square Drive Ratcheting Multi Bit Driver (48-22-2302): 10 functions include SQ #1, SQ #2, SQ #3, PH #1 PH #2, SL 1/8", SL 1/4", wire stripper, loop maker and ¼" nut driver. 10IN1 Torx® Key Driver (48-22-2103): 10 functions include TORX® T8, TORX® T10, TORX® T15, TORX® T20, TORX® T25, TORX® T27, TORX® T30, wire stripper, loop maker and ¼" nut driver. 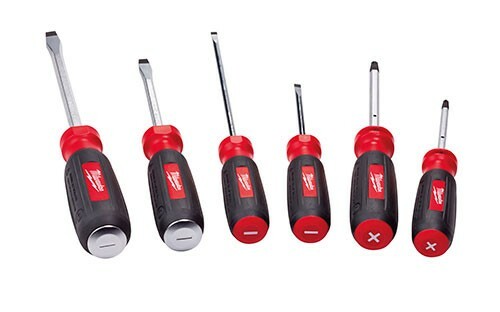 10IN1 HEX Key Driver SAE (48-22-2104): 10 functions include HEX 7/64", HEX 1/8", HEX 9/64", HEX 5/32", HEX 3/16", HEX 7/32", HEX ¼", wire stripper, loop maker and ¼" nut driver. 10IN1 HEX Key Driver Metric (48-22-2106): 10 functions include HEX 1.5mm, HEX 2mm, HEX 2.5mm, HEX 3mm, HEX 4mm, HEX 5mm, HEX 6mm, wire stripper, loop maker and ¼" nut driver. 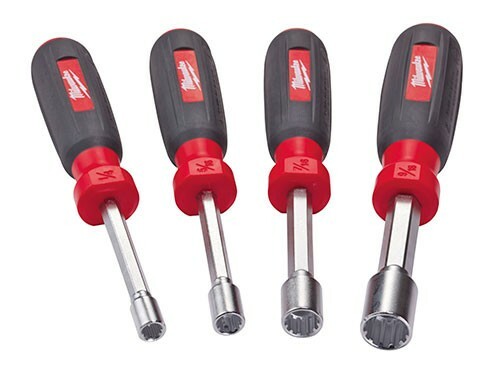 Featuring universal driver heads, Milwaukee's new 4-piece Nut Driver Set has the ability to remove square, hex, 12 point, and spline bits, including those who have been rusted or stripped. They come with a 3-inch long hollow shaft that allows them to reach down through long bolts and threaded rod. The driver shanks are forged and chrome plated for durability, and are also wrench-ready for additional leverage. Each driver also comes with clear marking so the drivers can be identified even while in storage. If you are working with high voltage regularly, you are going to want to check out Milwaukee's new Insulated Screwdrivers. 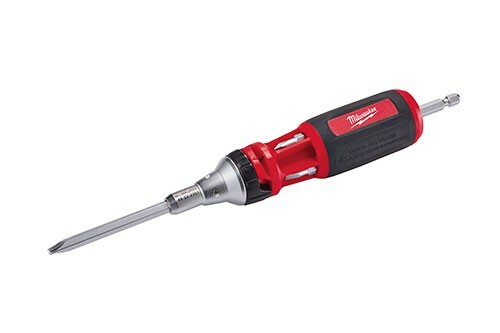 According to Milwaukee they are the first and only UL classified 1,000V insulated screwdrivers tested to IEC 60900:2012, ASTM F1505-10 & NFPA 70E standards, and they meet OSHA's insulated tool requirements. They feature a flame resistant insulation that has been bonded to the tool shank and a second outer layer with a visual wear indicator that acts as a warning for tool replacement. Even the identification marking are insulated.